Cycling is a great way to spend active family time outside. Bicycling is a popular, fun, healthy, and useful activity that people can do their entire lives. Bicycling provides low-impact exercise of variable intensity that improves health, fitness, longevity, mental focus, emotional balance, and stress levels. Traveling by bicycle is often more enjoyable and affordable than other modes, and can be more convenient where automobile parking is limited. Teaching children to travel effectively by bicycle as they get older develops patience, discipline, self reliance and personal responsibility. Learning to negotiate traffic by bicycle also teaches essential driving skills that will make them safer and more courteous motorists later. Per hour of activity, bicycling has an injury rate similar to common sports such as soccer, and a fatality rate lower than swimming and similar to that of automobile travel. The health benefits of bicycling outweigh any health risks by an order of magnitude in terms of disability adjusted years of life. Like swimming and motoring, the safety of bicycling is determined primarily by behavior; education and skill development are key to success. As a bicyclist’s skills and maturity progress, safe bicycle travel becomes possible in an increasingly wide variety of environments. An important consideration for cycling with children is matching route selection and adult supervision to the developmental and skill levels of the child. 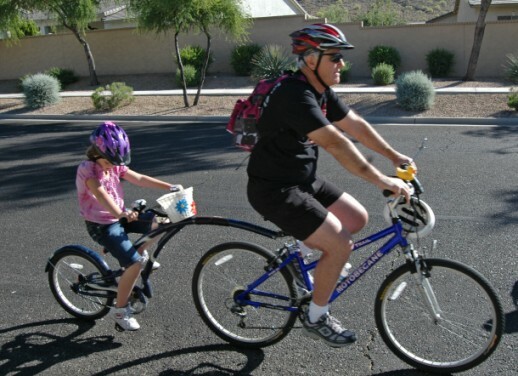 Many parents enjoy bicycling with children as young as one year old (when they can safely support their own weight and sit themselves upright) by using a variety of child trailers and seats. 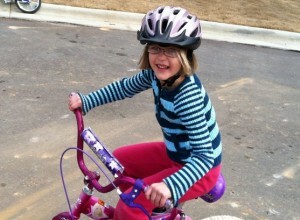 Transporting children as bike passengers allows parents to start modeling successful bicycling behavior early and helps interest children in bicycling. Bike trailers let kids ride while you stay in control. Enclosed two-wheel child trailers are ideal for children under four years old; the low center of gravity avoids affecting the parent’s balance on the leading bicycle, provides good handling, and minimizes the potential for a fall-related injury (the vast majority of injuries to kids cycling). Such trailers also provide room for toys and snacks inside the compartment, keeping little ones happy during the ride. 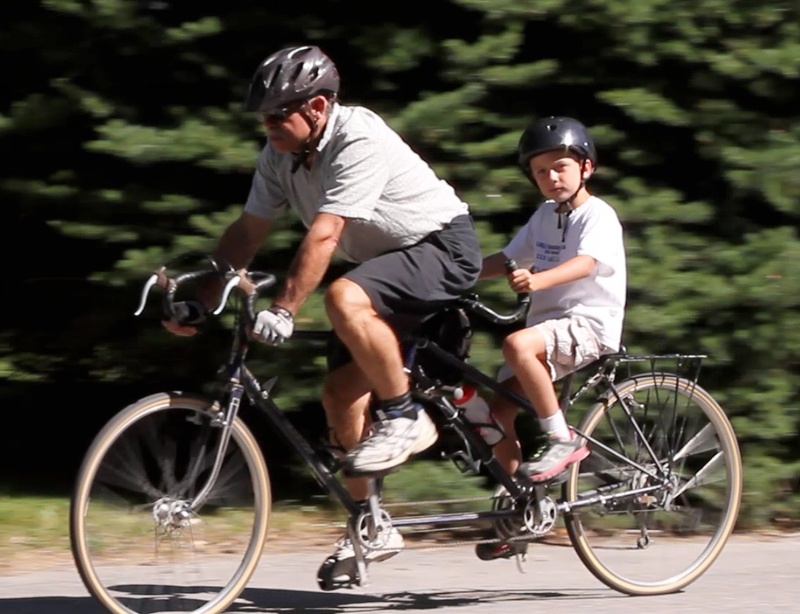 Somewhat older children will prefer trailercycles, aka trailer bikes, which attach to the back of the parent bicycle and feature one wheel, a seat, handlebars, and pedals to assist with the work. These trailers require more maturity and cooperation from the child and can be more difficult for the parent to control due to the higher center of gravity. Tandem bicycles are another option, and can be configured to work for children of various sizes as long as the child can stay seated. Child carrier seats are also available, and are usually the most affordable option for transporting children. However, a child in a carrier seat can make a bicycle top heavy and difficult to control, especially when mounting and dismounting. A tandem bicycle can be adjusted as the child grows. Long bike rides can be tiring or tedious for children; it’s useful to start small and break up longer trips with stops every 20 minutes or so. Planning a round trip to a destination of interest such as an ice cream shop, restaurant, or park works especially well. Water and snack breaks keep kids happy. 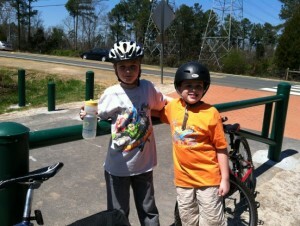 The essential skills required for safe cycling can be learned through informal mentorship (e.g. knowledgeable parents or other experienced cyclists), organized classes, or a variety of media. Children can learn bicycle handling skills very quickly, but take much longer than adults to learn traffic negotiation skills due to developmental factors and are limited in what traffic situations they can handle until they reach their teens. This requires that a child’s learning objectives and cycling environment be carefully selected by the parent or educator to match the child’s cognitive development and maturity. Basic bicycle handling includes starting and stopping, steering, riding in a straight line without swerving, looking back over one’s shoulder without swerving, and emergency braking. These skills should be taught in areas void of traffic, including other bicycle traffic. An essential traffic behavior that must be learned by children as soon as they start bicycling is to stop when they reach the edge of a driveway, path, or sidewalk. The most common cause of car-bike crashes involving children is when the child rides out from a driveway, path or sidewalk into the roadway without stopping and yielding to other traffic. Children often have “tunnel vision” that causes them to overlook or ignore threats outside their direct line of sight, and often lack the maturity to stop and look both ways when they are not aware of traffic in advance of reaching the edge. Riding with their child affords a parent the opportunity to supervise their child’s cycling, especially at edge locations such as street crossings. Practically all bicycling trips, including greenway rides, include intersection crossings and/or entrances into vehicular areas. Parents should model consistent behavior by stopping and looking both ways before proceeding, and invite the child to assist in assessment of traffic conditions. 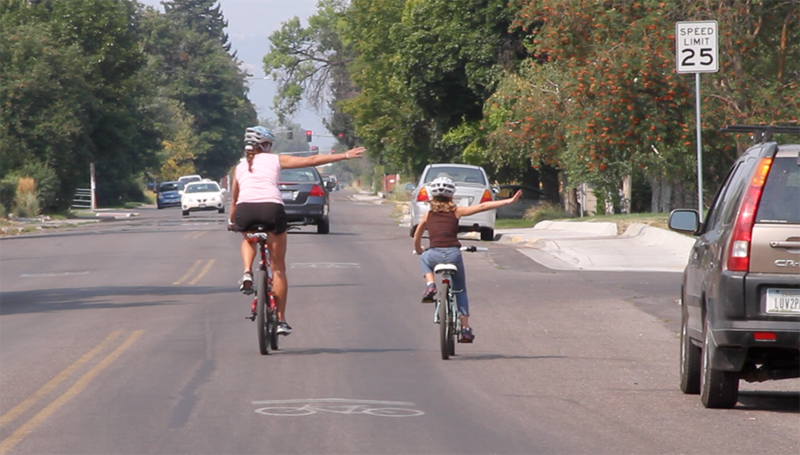 Kids’ enthusiasm for cycling easily outpaces their ability to understand traffic. Parents need to limit their children’s destinations and routes based on their cognitive ability and maturity. Although many parents and children are tempted to think of sidewalks as safe places for children to ride, traveling any distance on a sidewalk inevitably results in crossing intersections and driveways or crossing roadways mid-block. Such movements are associated with the most common collision types for child bicyclists, in part because of children’s errors, but also because motorists are less likely to notice bicyclists entering their path from sidewalk locations when they are focused on traffic approaching in the roadway. The most common type of car-bike crash in urban areas of NC involves a bicyclist riding on the sidewalk being struck by a motorist pulling out from a stop sign, red light, or driveway. Parents should consider all such conflict locations when deciding where they will permit their children to ride, and should supervise any and all crossing movements as needed depending on the maturity of the child. In general, if a child does not have the maturity to bicycle safely on the roadway portion of a particular corridor, the child probably lacks the ability to handle the more challenging intersection conflicts that accompany sidewalk cycling on that corridor – at least, without supervision. 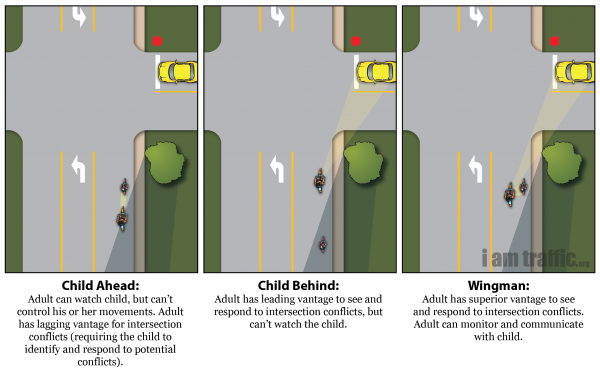 A suggested rule of thumb is to limit children’s bicycling to those areas where they are capable of safely negotiating the intersections as well as riding safely in the roadway itself. 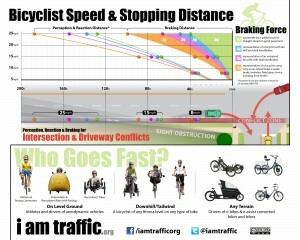 A leading contributor to car-bike crashes is bicycling on the wrong side of the road. At intersections, where the vast majority of car-bike collisions happen, other drivers aren’t expecting or looking for traffic approaching from the wrong direction. Between intersections, a wrong-way bicyclist requires a driver to make evasive maneuvers to avoid them; the driver cannot simply slow down and wait for a safe passing opportunity as they can with a same-direction bicycle traffic. For these reasons, traffic laws everywhere require bicyclists to ride on the same side of the road in the same direction as other vehicle traffic. In North Carolina, bicycles are defined as vehicles and bicyclists have the full rights and duties of drivers of vehicles. 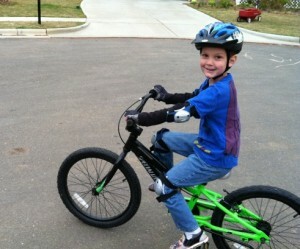 Children should be taught to ride on the right half of any corridor, including greenway paths and neighborhood streets. In combination with this, they need to learn to ride in a reasonably straight line, without suddenly swerving, so that other bicyclists and automobile drivers can travel beside them and pass them safely. They should choose an imaginary straight line down the roadway that keeps them safely away from surface hazards and parked cars. Prior to making an adjustment in their lateral position on the roadway, such as when noticing a parked car ahead, the bicyclist must look back and scan for traffic that may be about to overtake them, and only make the lateral movement when it can be made safely. Simply riding in a straight line well out into the roadway is not hazardous to bicyclists of any age, especially on the neighborhood streets where most children ride. What is hazardous is suddenly moving into that position unpredictably when a driver is too close to reduce speed. Positioning yourself to the left of your child encourages drivers to pass at greater distance. It also allows you better vantage of potential conflicts and makes it easier to communicate as you coach. 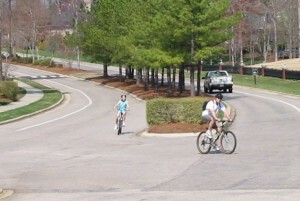 When riding with a child to supervise their bicycling, an ideal riding position is slightly behind and to the left of the child, with the child setting the pace. This position allows the parent or instructor to watch and communicate with the child, while also diverting overtaking traffic to pass at a larger distance from the child. The extra passing distance provides the “wiggle room” the child may require as their skill develops and makes the ride more comfortable for them. Children between the ages of 7 and 10 can develop the traffic and handling skills to operate safely on low speed, low traffic two-lane residential streets. 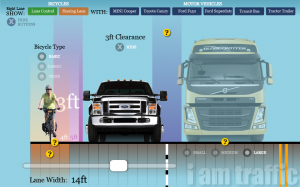 By their early teens, they can develop the skills to handle multiple lane streets. Although some cyclists may prefer more direct, important roads depending on their travel objectives, low traffic streets and greenways are often the most enjoyable places to ride for a wide variety of cyclists. Some cities provide maps that highlight low traffic streets and greenway routes; these can be of tremendous value in finding an enjoyable route for recreation or transportation. Google Maps includes most of the local greenway trails, which can be used when generating travel routes for bikes. The satellite and street view features of Google Maps are useful for determining the cross section and character of a street when choosing a route. Older cities often have a grid of low traffic streets that provide alternatives to busy roads. This is less common in some newer suburbs, but many progressive municipalities now actively pursue development of collector street networks and local street connectivity to provide redundant travel routes and to disperse traffic bottlenecks. 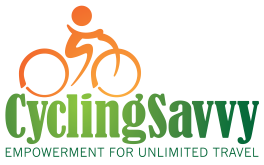 This allows many bicycle trips to be made on lower speed limit roads and two lane roads with wide pavement that afford easy passing at safe distance. Some cities have also developed an extensive interconnected system of greenway paths in their own rights of way. By combining pleasant streets and greenways, a wide variety of enjoyable low-traffic cycling routes becomes available for family cycling. Older children can develop intersection negotiation skills that greatly expand the range of routes available to them. Even after learning good cycling practices, kids usually start taking risks and short-cuts when they leave their parent’s sight, and are quick to emulate the bad habits of their peers. Parents can reinforce good practices by riding frequently with their children and discussing the reasons behind the rules. Parents can also monitor their children’s cycling behavior alone or with peers by catching up to them with their own bikes at unexpected times. Lastly, parents should always model good behavior when operating any vehicle. I am just returning back to cycling and I’m finding your site very informative. I may be able to use this in the future when I have kids already. Children that are good road cyclists presumably become good drivers if/when they learn to drive. They have a distinct advantage of learning the rules of the road over their peers who do not ride bikes with the correct knowledge and modeling. My daughter rides a trailer bike and loves it. When we are making turns she signals along with me. She started riding it when she was 4.5, we are looking forward to another fun summer of riding. She has been asking to ride to town which is 12 miles in a car on the main roads. I’ve ridden the back roads to town myself but haven’t tried it with the kids yet.